We are excited to announce the launch of a new restaurant website for Annie’s Fountain City Cafe. Annie’s has taken downtown Fond du Lac by storm. After opening in January 2016 Annie’s has seen an influx of customer’s drawn in by Annie’s desire to “create a space that felt like home” where residents of Fond du Lac could gather. Based on the community reaction it’s obvious she did just that. Annie’s was even named the winner in the Wisconsin Economic Development Corportation’s (WEDC’s) Main Street Makeover Contest. 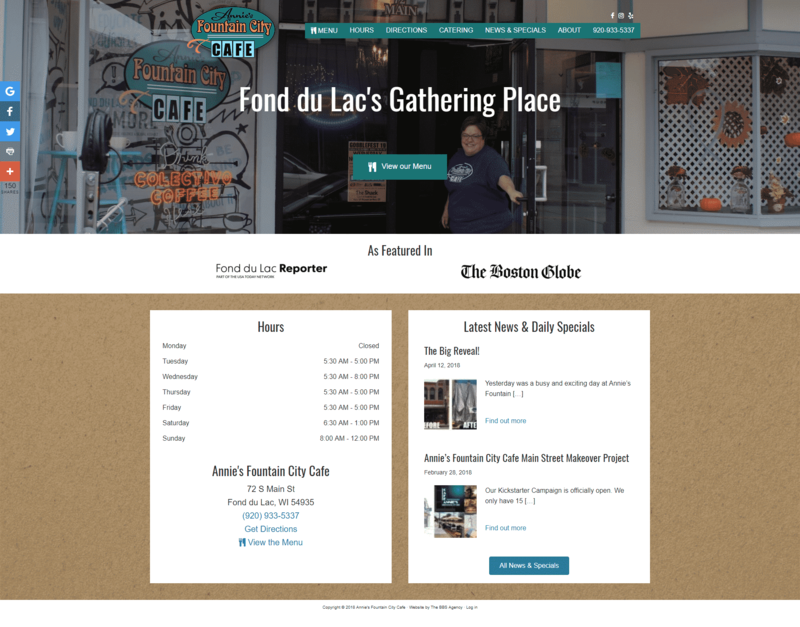 Our goal was to create a website that was as inviting and open as the restaurant, aptly known as Fond du Lac’s gathering place, resulting in Annie herself greeting you when you get to the home page. The simple design presents you all of the information you could possibly need about Annie’s hours, menu, and location without being overwhelming or crowded, while giving you the option to dive deeper into her offerings. One of the main goals of the website was making it easy for Annie and the team to share news about upcoming events and to broadcast their daily special to the world without having to be sitting behind a computer. Thanks to our custom setup anyone from Annie’s team can email the details of the special to the website and it will automatically be formatted and published to the world, resulting in Annie’s being able to broadcast the menu with the click of a button. Whether or not you’re looking for the latest special, directions to the restaurant, or the easiest way to get in contact with Annie you can find everything you need and more at: https://anniesfountaincitycafe.com/. The restaurant was built on the spirit of community you can find downtown, and we hope the website contributes to that for years to come.